국동의 창업자인 故 변효수 명예 회장님(이하 ‘명예회장님’)께서는 2016년 2월 인도네시아 공장건설을 진두 지휘하다 현지에서 타계하셨습니다. 명예회장님께서는 우리나라 니트의류산업이 사실상 불모지이던 1967년 (주)국동을 설립, 이 부문의 수출을 주도하면서 오늘날 니트의류 한국의 위상을 세우신 업계의 선구자이자 代父이셨고 산 역사였습니다. 1989년 인도네시아에 진출, 대규모 공장 신축과 증설을 거듭하였고 1999년 지구 반대편인 멕시코에 한국 의류기업으로는 최초로 진출, 염색, 편직 및 봉제 등 일괄 공정이 가능한 매머드 섬유공장을 세우는 등 글로벌 소싱을 위한 과감한 해외투자로 성공을 거두었습니다. 이는 후에 후발주자들이 앞다퉈 해외 진출에 나서게 되는 계기가 되었으며 선대회장님은 탁월한 선견지명을 가진 선도적인 기업인으로 평가받고 있습니다. 국동의 멕시코 공장은 현재 대미수출의 전초기지로 활용되고 있습니다. 87세로 타계하실 때까지 명예회장님께서는 인도네시아 현지 공장에 상주하면서 공장 건설과 생산 활동을 진두 지휘하셨습니다. 바탕지역 대규모 증설공장의 건설을 직접 이끄시면서 장남인 변상기 현 회장님에게는 “공장은 걱정 말고 영업만 전력투구하라”고 당부할 정도로 의욕이 넘치셨습니다. 수출만이 경제 보국이란 투철한 신념과 철학으로 평생을 섬유패션 외길을 고집해 온 명예회장님은 수출업계에 1천만불 탑 수상자가 가뭄에 콩 나듯 했던 1984년 무역의 날에 2천만불 탑을 수상한 데 이어 국무총리, 대통령산업포장 등 받았고 1996년에 5천만불 수출탑과 함께 철탑산업훈장을 수상하셨습니다. 또한 메리야스 수출조합감사를 역임하는 등 업계를 위한 봉사를 아끼지 않는 참된 지도자로 후배 기업인들의 존경을 받아왔습니다. 명예회장님은 일에 있어서는 철두철미하셨지만 인간적으로는 누구보다 따스하고 남을 배려하신 분이십니다. 가족보다는 일과 회사를 우선하셨고 잘못된 일은 꾸중보다는 묵묵히 지켜보시는 것으로 대신하셨습니다. 말로 표현하지 않으셨지만 주위 사람들에게 큰 나무처럼 그늘이 되어 주고자 하셨던 분이셨습니다. 국동을 그 누구보다 사랑하셨고 섬유와 니트를 사랑하셨던 명예회장님, 국동 임직원들은 회장님께서 보여주신 가르침과 정신을 바탕으로 앞으로의 국동 50년을 이어 나가겠습니다. Hyosoo Byun, Kukdong's founder and Honorary Chairman passed away in February 2016, in Indonesia, where he was involved with the construction of a factory. He was a pioneer and leader in the Korean knit industry for half a century. He led the export movement in 1967, when the knit apparel industry was virtually non-existent. He initiated big scale factory construction and expansion in Indonesia in 1989. In 1999, Kukdong was the first Korean apparel company to have a factory in Mexico. We have succeeded in making bold overseas investments for global sourcing, including establishing a massive textile factory capable of batch processing such as dyeing, knitting and sewing. This served as the impetus for other companies to step-up their own expansions overseas. Mr. Byun was regarded as a leading businessman with excellent foresight. The Kukdong plant in Mexico is now being used as the primary base for exporting to the United States. Until his death at the age of 87, he resided in a local factory in Indonesia and led the factory construction and production activities. When he personally supervised the construction of a large-scale expansion plant in the Batang area, he said to the eldest son, Mr. Sangki Byun, with excitement in his voice, "Do not worry about factories but go all out for the sales." To be presented with the $10 Million Export Tower Award for the export industry was a rare event, but on Trade Day in 1984, Mr. Byun, was awarded the $20 Million Export Tower Award and also received the Minister's Award from the Ministry of Internal Affairs and the Presidential Industrial Citation. In 1996, he won the Iron Tower Industrial Medal and the $50 Million Export Tower Award. Mr. Byun was devoted to the textile industry his entire adult lifetime. He participated in numerous industry associated organizations including as an auditor of Meriyas Export Association. He was respected by fellow businessmen; young and old alike, for his leadership, his groundbreaking work, his unwavering principles and values, and his philosophy for success in the garment export industry. The former chairman was warm hearted and caring. He expressed himself better by his actions than by his words. He was the one who wanted to offer shade to the people like a big tree. He was a patient person and he would offer a second chance to a person rather than scold them for a mistake. 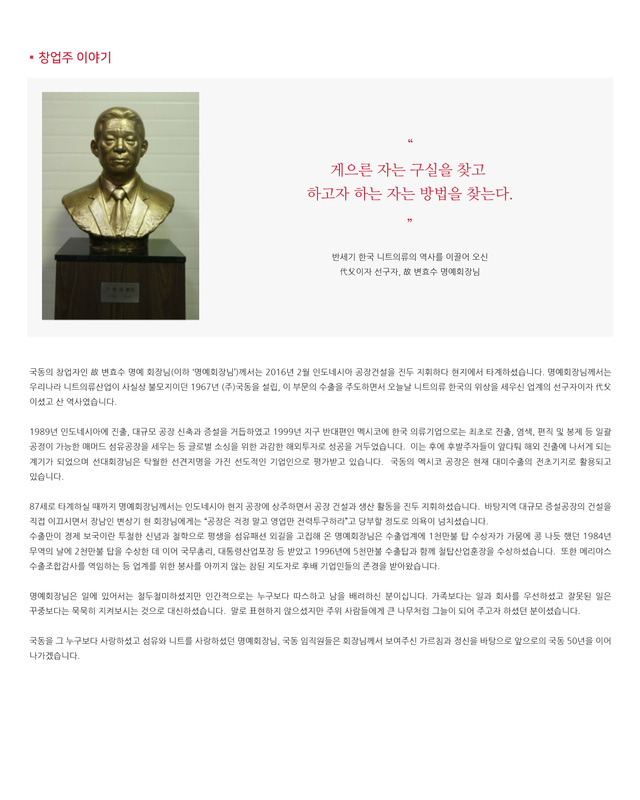 Mr. Byun loved Kukdong and the company took priority over his family. He devoted his life to the textiles and knit industry. The former President laid a strong foundation for his company’s future through his resilient spirit, his thorough work and his wise teachings. Kukdong will endure.